You are a wine connoisseur and you have a 100-plus-bottle of vintage collection. Let us introduce you to the elegant and sophisticated Kalamera 157-bottle wine cooler – enchanteur! This Kalamera 157-bottle stands at 69.6-inch tall – free-standing as tall as your refrigerator. 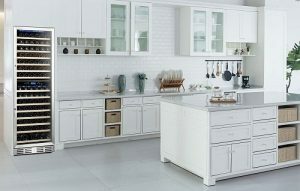 Built-in or free-standing installation is fit for this gorgeous appliance. This Kalamera wine cooler is both beautiful and powerful. Stainless steel door frame and triple-layered tempered glass door – super strong and ready to protect your collection from UV light! This Kalamera 157-bottle model is built with advanced cooling system by Kalamera. Powerful compressor-based with low noise and low vibration. This Kalamera is 5’ and 8” tall and 23.4-inch wide – sleek, tall and slender, with front-venting. Versatile installation – either free-standing or built into your kitchen or your bar. This model has a reversible door – giving you the flexibility to configure the door to open to the right or left. Installation tips: This is a premium wine cooler and it performs the best if you follow these tips. You want to let your wine cooler to stand upright (vertically) for 24 hours before you connect it to the power source. Once you plug-in the power and set the desired cooling temperatures, allow the cooler to chill (without storing any wine bottles) to the set temperatures. Give another 24 hours before you start storing your vintage wine collection in the cooler. Wooden shelving: This Kalamera has fifteen sliding beech wood shelves to house 157 standard Bordeaux size bottles (750ml each). Beech wood is soft, strong and pretty – the lighter color wood complements the deeper color hue of wine bottles. Soft wood will not scratch your wine labels. 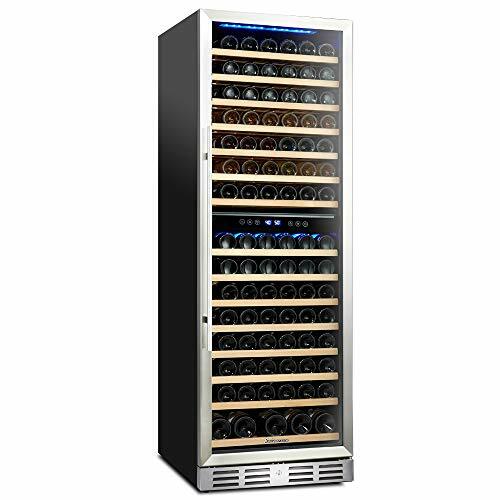 With this large 157-bottle capacity, you have more options to organize your collection in your wine cooler. A row of Cabernet Sauvignon, a row of Pinot Noir, another row of Beaujolais? Perhaps organize your collection by vintage years? Isn’t it wonderful to have options? You can also remove a shelf to fit any magnum size (1.5 Liter) bottles. Dual temperature zones: You want a dual-zone wine cellar for your diverse wine collection. 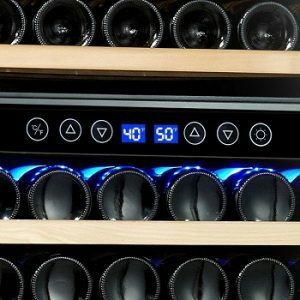 This Kalamera 157-bottle wine cooler has a dual zone cooling system; temperature range: 40°-50°F in the upper zone, 50°-66°F in the lower zone. This temperature range can accommodate vintages such as Beaujolais, Chablis, Champagne, Chardonnay, Cabernet Sauvignon, Pinot Noir and Sauternes, etc. A dual-zone is a smart choice – it obviously gives you more flexibility than a single-zone anytime. This Kalamera unit has auto-defrost. You don’t have to worry about ice building up inside the unit. This Kalamera 157-bottle stands at 69.6-inch tall – free-standing as tall as your refrigerator. Built-in or free-standing installation is fit for this gorgeous appliance. LCD temperature control: and temperature memory function. The LCD temperature display is intuitive and simple to use. This convenient feature allows you to monitor and easily set the preferred temperature for each cooling zone. Notable feature: This Kalamera 157-bottle has a temperature memory function. You will appreciate this feature when you run into a power outage. This unit will restore the set temperature the power is back on. This Kalamera 157-bottle unit features a soft blue ambient light to illuminate your vintage collection. This Kalamera unit has a built-in universal hexagon-bolt lock. A good feature to discourage young children or un-wanted guests not to open your wine cooler frequently. Warranty and support: This Kalamera 157-bottle comes with one-year limited warranty by Kalamera. Summary: This Kalamera KRC-157DZB-TGD 157-bottle wine cooler (view on Amazon) is a premium large capacity wine cellar. This Kalamera is beautiful and packed with many deluxe features such as: stainless steel frame, triple-layer glass door, advanced dual-zone cooling system and temperature memory function. 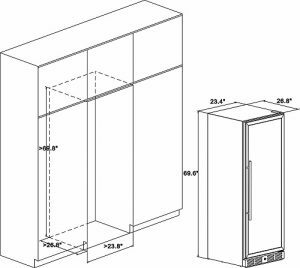 Large capacity, dual-zone, removable beech wood racks, temperature memory and triple-layer tempered glass door.